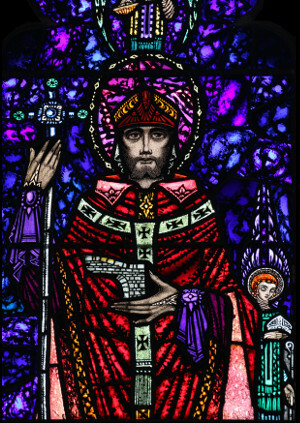 The beautiful window in the centre of the south wall was subscribed to by the parishioners of St Cuthbert’s in affectionate memory of Canon William Brown, who came as a curate in 1874 and served as Parish Priest from 1887 – 1924. 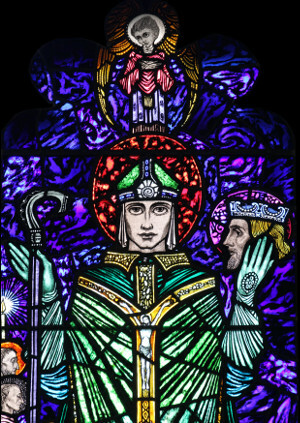 St William of York, bearing a broken arch as his symbol. On his return to York after being dismissed from his Archbishopric there on false charges, the crowds were so great to welcome him back, that a bridge over the River Ouse collapsed, but by his prayers, there was no loss of life. Next is St Cuthbert who holds the head of St Oswald, King of Northumbria, killed by the pagan King Penda at the Battle of Maserfield. The head was placed in St Cuthbert’s coffin when the monks fled from the Danes, taking the body of their beloved saint with them. 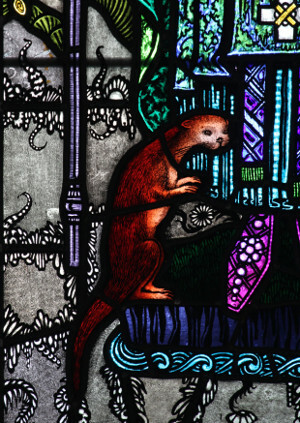 At St Cuthbert’s feet are the otters which came to dry his feet after he stood all night in the sea to do penance. Below Cuthbert is Blessed Thomas Percy, one of the leaders in the rising of the North against the religious changes under Elizabeth I. 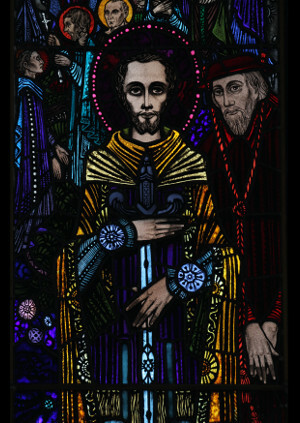 He took refuge in Scotland after the failure of the rising, but was handed over to Elizabeth and condemned for treason. Offered his life if he would renounce his faith, he refused and was executed at York. Surrounding him are the smaller figures of the English Martyrs connected with the North. The Cardinal is probably Cardinal Allen who was responsible for the training of many priests (and martyrs) at Douai for the English Mission. 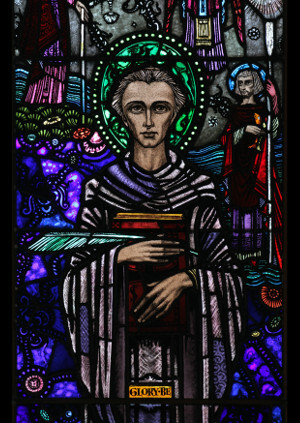 Next to Percy is St Bede with his pen and the Book of the Gospels which he translated into Anglo-Saxon. Below him is another book, presumably his Ecclesiastical History of the English People. The smaller figures surrounding him include St Hilda wearing a mitre as Abbess of Whitby. 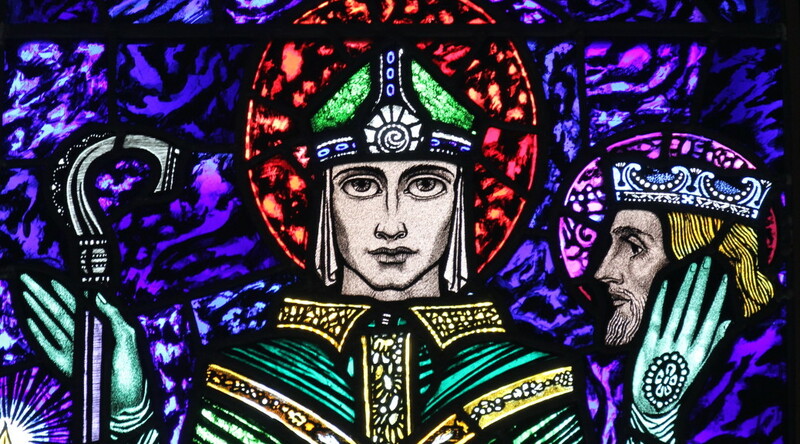 The brilliant colours of the window with the smaller figures surrounding the protagonists, together with the brightly coloured flowers scattered around, give a jewel-like effect which is characteristic of Harry Clarke’s work. 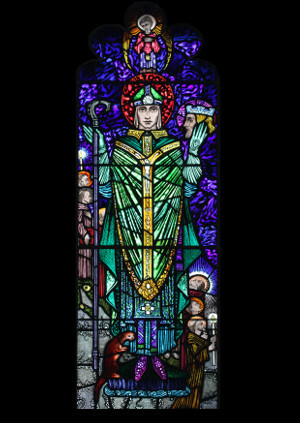 The window underwent a major restoration in 2013 by Iona Art Glass through the generosity of the Pilgrim Trust, the Glaziers’ Trust and gifts from individuals. Broken glass was repaired, and the whole window cleaned, re-leaded and reframed. The windows is now restored to its original radiance, serving as a visible reminder of how God’s grace works through his saints.